It’s important to keep your home clean both for sanitary reasons and to make it pleasant to live in. Many people think that cleaning your house naturally using natural home cleaners is more difficult than using store bought chemicals. The truth is using natural cleaners to clean your house is not any harder than using store bought chemicals. Using natural cleaners is safer for you, your children, and your pets as you won’t be breathing in the harsh chemicals from store-bought cleaners. Can I buy green cleaners at the store? Many people mistakenly assume that switching to homemade natural cleaners is hard. Sure buying a premade cleaning product from the store is simple and easy, but you can make some of the best cleaning products in the same amount of time it takes you to go to the store. One thing about natural home cleaners is they aren’t labeled as household cleaners, not even in commercial advertisements. These cleaners don’t use any artificial help to cut through grease or kill bacteria. Homemade natural cleaners are quick and easy to make especially if you always have these key cleaning ingredients on hand. 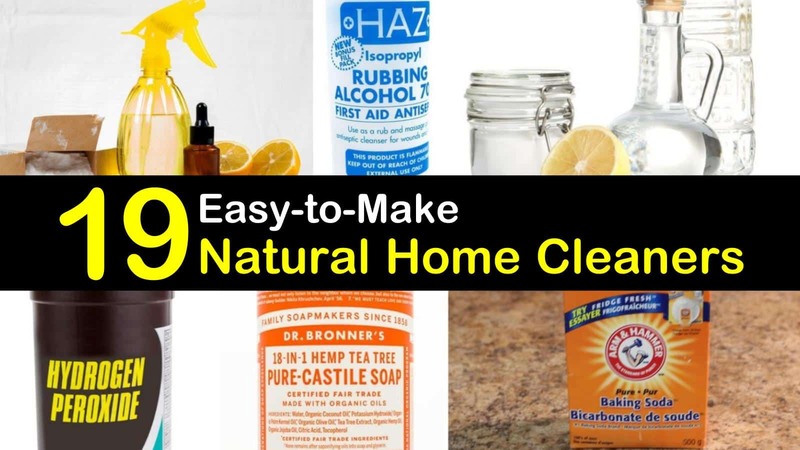 Here’s a more detailed look at these all natural cleaners and how to find out the advantages that natural products provide you and your family. Sometimes we want the convenience of not having to make our household cleaners, but that doesn’t mean we want to use harsh chemicals. If you’re going to make life a little easier or perhaps you want to get away from always using vinegar or Borax, you need to look into the green cleaners in stores. Here is more detailed information on the more popular store-bought green cleaners we have found useful. Dr. Bronner Sal Suds – This concentrate is considered an all-purpose cleaner and does its job quite well. The concentrate is a natural formula with a coconut base. To use, mix the solution with a few cups of water. The ratio of Sal Suds to water will vary based on the task at hand. Bon Ami Powder works great for scrubbing away grime and tougher stains. It’s a natural scouring powder that is safe to use on stainless steel. Dr. Bronner Liquid Castile is used in quite a few DIY recipes for household cleaning but can be used for personal care, including foaming hand soap. Branch Basics – This chemical-free cleaner was made by a mother whose son has a chemical sensitivity. The concentrated solution needs to be diluted before use as an all-purpose household cleaner. Natural cleaning methods might be safer for you and your environment, but that doesn’t mean they don’t come without challenges. Many people who have switched from harsh chemicals to homemade natural cleaners have gone through a trial and error period. We are here so you can skip ahead of the class. With our helpful tips, you are guaranteed natural cleaning success. Ovens are one of the biggest cleaning challenges in the kitchen. Oven cleaners contain harsh chemicals and leave behind nasty fumes. The self-cleaning cycle, if you are “lucky” enough to have one, leaves behind unpleasant odors and lots of smoke. The best way to clean an oven is a baking soda paste spread along the bottom of the oven for a few hours. It works wonders. How you clean your cutting board will depend on how you are using your cutting board. You need to clean, deodorize, and disinfect your cutting board regularly. There are several natural cleaning products you can use. Cleaning your cutting board, even a wood cutting board, is relatively straightforward. Use a small amount of liquid Castile soap and some hot water. Wood boards should never be fully submerged in water as it will ruin the wood over time. Deodorize the board using half a lemon or lemon juice and coarse sea salt. In addition, it also shows one of the many amazing uses for hydrogen peroxide at home. Disinfecting the cutting board is done by spraying the board with vinegar and then hydrogen peroxide, but do not spray them both on the board at the same time. There are several natural cleaning recipes that you can use to clean your dishwasher. One quick and easy way is to fill a small Pyrex bowl with a couple of cups of vinegar. Rest the bowl on the top rack of the dishwasher and run your dishwasher using a hot cycle. Natural cleaners are a necessity for cleaning garbage disposals, especially for those who use their disposal more than once a day. The more you use your disposal, the more frequently you notice disgusting odors. Cleaning your disposal is only one step; you need to use other natural cleaning ingredients, such as lemon peels or baking soda and vinegar to combat tough smells. Exposed to all of the grease and grime from the food you cook, the stove vent fan is the single nastiest item in your kitchen. Many people assume the only way to successfully cut through all of that grease and grime is with a commercial degreaser, but they would be wrong. Use baking soda with boiling water to clean the filter. Then use a homemade degreaser to clean the rest of the stove vent fan. Tubs and showers are home to nasty soap scum build up. Using one of our simple DIY bath cleaner recipes you can quickly and easily cut through that soap scum. If our homemade shower cleaner recipe isn’t doing the job, you can try this simple recipe to tackle soap scum. Combine peroxide and baking soda to form a thick paste. Spread along the tiles with a damp sponge. Allow it to sit on tiles for 30 minutes. Scrub paste with an old toothbrush and rinse with warm water. Don’t have a tub? Check out these natural shower cleaner recipes instead. Hydrogen peroxide is an excellent bathroom cleaner. Mixing equal parts water and peroxide in a glass spray bottle is an effective way to kill mold, but if that isn’t strong enough, you can use straight hydrogen peroxide directly on the mold. It also works well on mildew. If you are trying to lead a better life by going chemical free, you might have questions about toilet bowl cleaner. Easily the nastiest place inside the bathroom, you want to make sure this germ haven is thoroughly cleaned. For a safe, non-toxic alternative look into our DIY toilet bowl cleaning liquid using tea tree oil. We also have an excellent heavy duty recipe that can help tackle those nasty rings and messes left behind after unclogging a toilet. And with a little lemon essential oil and some lavender essential oil, it will leave your bathroom smelling nice and fresh. In a spray bottle mix all four ingredients. Flush the toilet to dampen the inside of the bowl. Squirt or dump the entire bottle in and allow to sit for several hours. For tough stains allow sitting overnight. Scrub the toilet with a brush and flush to rinse. Dirty, stinky, and stained carpets are part of living. Paying to have your carpets professionally cleaned is expensive, but also introduces chemicals into your home. 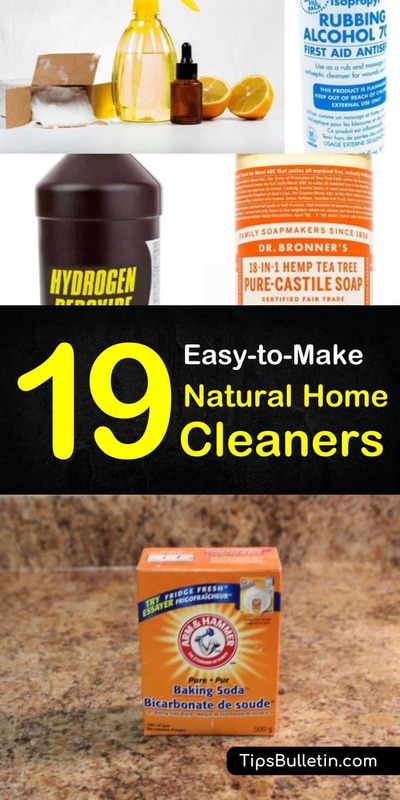 You can easily make your own natural carpet cleaner solution for any steam cleaner with a few natural products you already have at home. Fill your steam cleaner tank with warm water. Add dish soap, vinegar, and hydrogen peroxide. Lastly, add the lemon essential oil. Gently stir and clean your carpets. For more natural carpet cleaners, stain removers, and deodorizers check out our article on DIY carpet cleaners. To clean and disinfect floors, you need a mopping solution that can do it all. Our homemade all-purpose floor cleaner combines ingredients like rubbing alcohol and liquid dish soap to leave your floors nice and clean with the perfect shine. This solution can work on tile, linoleum, laminate, vinyl, and hardwoods. It can even be used on marble and granite, but do so sparingly as vinegar can harm the porous marble and granite. When eliminating chemicals from your home, you have to find a suitable replacement for laundry stain removers. Our homemade washing powder recipe and other laundry soap recipes are excellent solutions for removing stains on clothing, including tough stains like grease. When it comes to natural laundry detergent, each of the main ingredients you add has a specific purpose. Vinegar works as a fabric softener, baking soda is a water softener, and Borax improves the cleaning power of any soap or other cleaners you add. None of our homemade laundry detergent recipes are too sudsy, so they will all work in regular and HE washers. Vinegar is by far the best natural fabric softener you can find. Using vinegar as a fabric softener won’t leave any residue on your clothes. During the rinse cycle of your washing machine add a cup of vinegar. If you want scent, add a few drops of essential oil as well. Windows and other glass found around the home are the worst things to clean. No matter how often you clean, it seems within a few minutes they are smudged or streaked. For a basic natural window cleaner, a microfiber towel, white vinegar, and water work great to clean your glass naturally, but adding a few other natural and non-toxic ingredients allow even better results. Linen sprays are great air fresheners for your home. Natural linen sprays can be made within 5 minutes with a handful of natural ingredients you already have inside the home. Once made spritz around the house to leave your possessions and rooms smelling fresh and new. All-purpose cleaners can be used everywhere in your home and on a variety of surfaces. Many of our general DIY cleaner recipes are ideal for general house cleaning. Our general cleaners that contain liquid Castile soap clean counters, sinks, and even tubs. Recipes using hydrogen peroxide disinfect easily, while vinegar is a natural degreaser. Look over the ingredients in our homemade cleaners to choose the right one the task at hand. If you have unfinished wood furniture chances are they have fallen victim to at least one water stain. Luckily, there is a natural way to rid your furniture of these unsightly blemishes. Mix the ingredients to form a paste. Rub the paste onto the water stains until the stain is eliminated. To clean up leftover residue use a clean, damp cloth. Polish the wood with one of our homemade furniture polish recipes. Using a natural carpet freshener will not only help the whole room smell fresh and new, but you can use specific ingredients for more effectiveness. Combining Borax, essential oils, and baking soda will keep rodents at bay, disinfect your carpets, and kill fleas and their eggs. Your mattress is home to some pretty unsavory stuff – dead skin cells, dust mites, oils, chemicals, and dirt. Vacuuming your mattress only goes so far; you need to thoroughly clean and deodorize your bed as well as remove any stains. Learn more about how to naturally clean, to deodorize, and remove stains from your mattress here. Thank you for reading about our natural, eco-friendly cleaning methods for around the home. If you found these cleaning tips or recipes helpful, please take a minute or two to share this post on Facebook and Pinterest.